Take the water where you want it with the AQUA JOE heavy-duty garden hose. The 5/8-inch flow, kink-resistant 100' hose features durable zinc fittings for secure, leak-proof connections plus a protective bend-restriction sleeve for uninterrupted flow. Constructed of rugged, kink- resistant high-grade PVC for maximum durability and performance. Lead-free, phthalate-free and BPA-free. Perfect for watering the flowers, washing the car, rinsing patio furniture or connecting to a lawn sprinkler. All weather premium rubber hose 5/8" x 100'.Anti kink heavy duty spring guard. Abrasion resistant cover. Nickel plated brass fitting.UV and ozone protection. 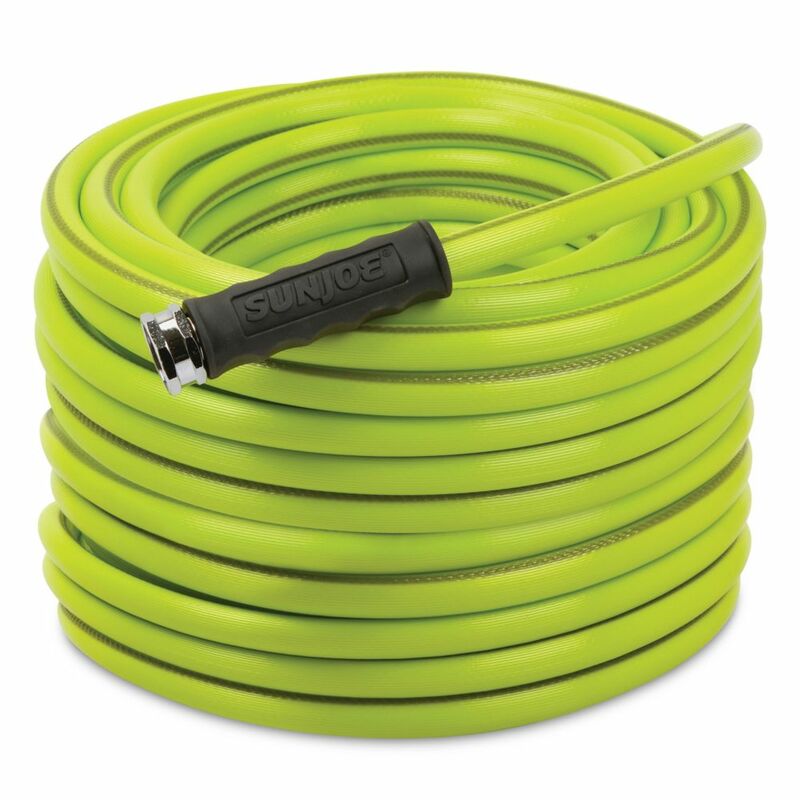 This All Season Premium Water Hose (5/8" X 50') with a unique blend of materials which makes it extremely Flexible and Kink Resistant. Triple Layer Construction and Rayon Braided Re-enforcement, Resistant to UV Rays, Oil and Chemicals, Spring End Protectors adds to its tremendous Durability. High Quality, Long Neck Crush Proof Octagonal Fittings for easy connection with any faucet. Best mobility and all weather applicability, great for Winter Activities (Ice Rink Flooding), Power Washing, Watering, Gardening and Water Games. 5/8-inch x 100 ft. Heavy-Duty Garden Hose Take the water where you want it with the AQUA JOE heavy-duty garden hose. The 5/8-inch flow, kink-resistant 100' hose features durable zinc fittings for secure, leak-proof connections plus a protective bend-restriction sleeve for uninterrupted flow. Constructed of rugged, kink- resistant high-grade PVC for maximum durability and performance. Lead-free, phthalate-free and BPA-free. Perfect for watering the flowers, washing the car, rinsing patio furniture or connecting to a lawn sprinkler. 5/8-inch x 100 ft. Heavy-Duty Garden Hose is rated 3.7 out of 5 by 20. Rated 5 out of 5 by Pastor Ray from Best Garden Hose ever! 100ft hose stretches all the way back to the rabbit cages and my chicken pens. I plan on getting at least 2 more especially 1 for the front yard. I will buy this Hose again . Rated 5 out of 5 by sonia from This hose is very light weight and easy to move. This hose is very light weight and easy to move. Rated 1 out of 5 by Joe from Worst hose ever! When I removed hose from binding and stretched it out on lawn, it kinked every 8... Worst hose ever! When I removed hose from binding and stretched it out on lawn, it kinked every 8 feet or so. Returned it to Home depotr for another make. Rated 4 out of 5 by Syd P from works well. good ends I have two of these for my property. Both work well they do kink a bit. But unlike other houses these do not retain the kinks memory. Rated 4 out of 5 by Owen from It does seem serviceable, but is not as lightweight nor... It does seem serviceable, but is not as lightweight nor kink-resistant as I had expected. Can someone from Sun Joe please tell me how they rate this hose as heavy duty. In home depot spec's it is standard rating. If it is rated heavy duty how do you do your rating.